An artist's rendering of a new $185 million swim center in Santa Clara. The Santa Clara International Swim Center has hosted and trained Olympic champions like Mark Spitz for decades. Those athletes have gone on to win 71 Olympic medals. The swimming facility was world class when it was built in 1968. Now, its age is showing. “The whole infrastructure, the piping, the filtration system, the electricity, everything is shot, and it cannot be fixed,” said Cynthia Owens, executive director of Silicon Valley Aquatics Initiative. 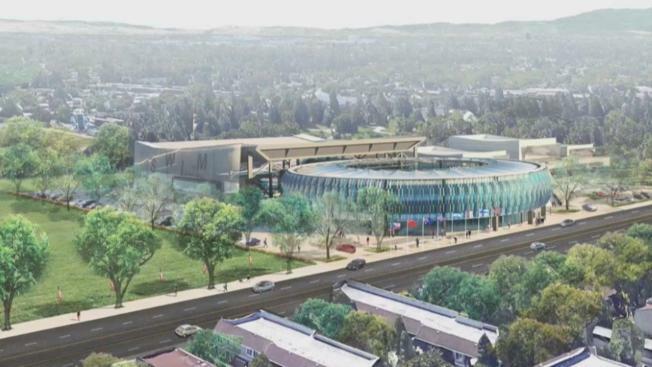 Members of the Silicon Valley Aquatics Initiative are working to build a multimillion-dollar swimming complex on the other side of the current center in Central Park. The complex would feature an aquatics stadium and host the International Swimming Hall of Fame. “It's a great investment; it's going to make Santa Clara better. It's going to improve the lives of our citizens,” Owens said. On Tuesday night, the Santa Clara City Council approved initial plans for the project that would include a community recreation center and gym as well as a three- to four-story parking garage. Karen Suty is the principal of Saint Justin School, which would be adjacent to the proposed garage. Suty is supportive of the project but is concerned over the garage location. “It [would be] literally 17 feet from our playground to this gargantuan garage,” she said. Other people at the council meeting worry the garage wouldn’t have enough spaces, while some were concerned about increased traffic. Council members said some small aspects could be still amended. The biggest question now is who will pay for the project, estimated to cost nearly $185 million. “That is daunting,” one council member said. City and project leaders will meet in October to talk about financial proposals.